Case of 12 mind-blowing metal vehicles! Straight from your favorite Star Wars movies and comics. Ships, cruisers, fighters, tanks, speeders, AT-ATs, and more. Each features moving parts, die-cast metal, and a display stand. 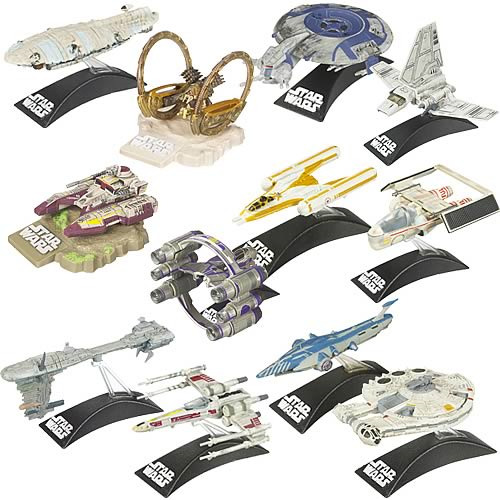 Own the cruisers, fighters, tanks, speeders, AT-ATs, and other mind-blowing vehicles from your all-time favorite Star Wars movies and comics! The collectible and highly desirable vehicles in this matchless assortment are designed with moving parts, real die-cast metal, and display stands. Grab them while you can. They move fast! Vehicles are all about 3-inches in size but are not necessarily scaled to one another. Ages 4 and up.